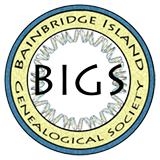 The Bainbridge Island Genealogical Society (BIGS) will meet Friday, March 15, 2019, at the Bainbridge Island Public Library on Bainbridge Island, 1270 Madison Ave, from 10:00a.m. – 12 noon. The topic for the Monthly BIGS Meeting will be “Preserve and Digitize Over-sized Items” The presenters are Mary Hammer and Maggie Cogswell, Preservation and Imaging Experts from the Washington State Archives. This program offers a special opportunity to learn from the professional experts. Parking is available in the 2 library parking facilities, accessed from High School Ave and Madison Ave North. Free to members, a $5.00 donation is suggested for nonmembers. For more information go to http://www.bigenealogy.org or call 206-755-9283. BIGS is a 501c(3) non-profit organization. The Bainbridge Island Genealogical Society (BIGS) presents Family Search: WAYS WITH THE WIKI on Friday, January 18 2019, at 10am to noon at the Bainbridge Island Pubic Library. The presenter is Joleen Aitchison, BIGS member, noted Puget Sound researcher and expert on the Family History Library. Learn how best to use the FHL WIKI to navigate the internet and further your genealogical research. Free to members, a $5.00 donation is suggested for nonmembers. For more information go to https://bigenealogy.org/. BIGS is a 501c(3) non-profit organization. Parking available in the Madison Ave lot and the High School Road lot. The Bainbridge Island Genealogical Society (BIGS) hosts their Annual Genealogy Holiday Fest “Show and Tell” on Friday, December 21, 2018, at 10am to noon at the Bainbridge Island Pubic Library. Bring your Family Treasures, Stories, or Research to share. Light Refreshments will be served. Free to members, a $5.00 donation is suggested for nonmembers. For more information go to https://bigenealogy.org/. BIGS is a 501c(3) non-profit organization. Parking available in the Madison Ave lot and the High School Road lot. The Bainbridge Island Genealogical Society (BIGS) presents “Anatomy of a Civil War Record” on Friday, November 16, 2018, at 10am to noon at the Bainbridge Island Pubic Library. The guest speaker is Jill Morelli, C.G. and President of the Seattle Genealogical Society. Free to members, a $5.00 donation is suggested for nonmembers. For more information go to https://bigenealogy.org/ BIGS is a 501c(3) non-profit organization. DNA Test Results: What Do They Mean? On Saturday, Oct. 27, 2018, the Bainbridge Island Genealogical Society (BIGS) and the Bainbridge Island Public Library, in recognition of National History Month, hosts a special DNA Event that is free and open to the public. For people who have received their DNA test results, sign-up for a one-on-one 30-45 minute session to help you understand what your results tell you. Register online, by phone (206-842-4162) or in-person at the Library. Please Note: Specific DNA medical results from 23andMe will not be addressed. You may bring your own laptop or a library computer will be provided. If you haven’t had your DNA tested and are curious, you don’t need an appointment, Just stop by for information on the different types of testing available, companies that provide the service, costs, and what you can learn from your results. BIGS members will be available for discussion and questions. Save the Date and Register Now: Online via the KRL Events calendar (http://www.krl.org/events/dna-test-results-what-do-they-mean), or register by phone (206-842-4162), or in person at the Bainbridge Island Public Library, 1270 Madison Ave N, Bainbridge Island, WA 98110. Appointments are between 10am-3pm and walk-in information available 10am-4pm. The Bainbridge Island Genealogical Society (BIGS) presents “Unearthing Records on your Revolutionary Ancestors” on Friday, September 21, 2018, at 10am to noon at the Bainbridge Island Pubic Library. The guest speaker is Sylvia Hasenkopf, A.G., an expert researcher in Palatinate, Colonial, and Revolutionary eras. Ms Hasenkopf is also a noted columnist, and house historian from Greene County, New York. Free to members, a $5.00 donation is suggested for nonmembers. For more information go to https://bigenealogy.org/ BIGS is a 501c(3) non-profit organization. The Bainbridge Island Genealogical Society (BIGS) will meet Friday, July 20, 2018, at the Bainbridge Island Public Library, 1270 Madison Ave N from 10:00a.m. – 12 noon. Guest speaker Jewell Lorenz Dunn, A.G., Washington State Archives will present “Immigration Law and Records”. Free to members, a $5.00 donation is suggested for nonmembers. For more information go to http://www.bigenealogy.org or call 206-780-8009. BIGS is a 501c(3) non-profit organization. The Bainbridge Island Genealogical Society (BIGS) will meet Friday, June 15, 2018, at the Bainbridge Island Public Library on Bainbridge Island, 1270 Madison Ave, from 10:00a.m. – 12 noon. The topic for the Monthly BIGS Meeting will be “Making Use Of Land Records” presented by Jerri Thorpe McCoy, a Washington genealogist and current historian for the Washington State Chapter of the Mayflower (Descendants) Society. Free to members, a $5.00 donation is suggested for nonmembers. For more information go to http://www.bigenealogy.org or call 206-780-8009. BIGS is a 501c(3) non-profit organization.